What if you owned a car detailing company and had the opportunity to go shine Air Force One? That seems to be an incredible ‘3rd Party Validation Celebrity Endorcement' for that industry, right? Not many detailers get that chance (I can only liken it to getting to detail Jay Leno's auto collection). Do you think you would post a few (dozen) photos of you doing that job? Here is the front web page for a company that had that opportunity. We had chatted with them prior to their trip on how to score from the event. I happened upon their site today and… nothing. Though there is a mention that they were trained by a guy who has detailed AF1…. Even if they were not allowed to post pix of them doing the work, there should be a photo of the plane, and noting when they got to work on it. Opportunities like this do NOT happen all the time. When they DO, you have to GRAB them, and use them to build your business. c. It is even BETTER to have those testimonials on video. 3. Celebrity 3rd Party Validation testimonials. When you can get a celebrity to give you a testimonial, that is grand. They may not have the professional pizazz, but their kind words give you solid 3rd party validation. 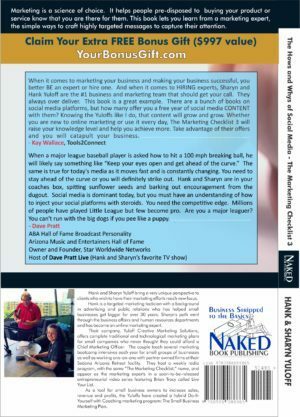 We have been fortunate to have Dave Pratt, owner of Star Worldwide Networks and a radio Hall of Fame member, give us testimonials for our last two books. His style is pure fun: “When a major league baseball player is asked how to hit a 100 mph breaking ball, he will likely say something like “Keep your eyes open and get ahead of the curve.” The same is true for today's media as it moves fast and is constantly changing. You need to stay ahead of the curve or you will definitely strike out. Hank and Sharyn are in your coaches box, spitting sunflower seeds and barking out encouragement from the dugout. Social media is dominant today, but you must have an understanding of how to inject your social platforms with steroids. You need the competitive edge. Millions of people have played Little League, but few become pro. Are you a major leaguer? You can't run with the big dogs if you pee like a puppy.” This gives anyone who knows and listens to Dave Pratt insight that they should buy our books. We have also received this CELEBRITY endorsement from Kevin Harrington, the original Shark on the ABC hit television show Shark Tank: “What I love about Yuloff Creative is that they become an in-house agency (marketing department) for small business owners. I think that’s a brilliant idea. They think as if they are the small business owner’s partner….They are true mentors and coaches that are truly looking out for the best interests of their clients…. Over 30 years together, there’s some wisdom going on here. You gotta check them out. Hank and Sharyn Yuloff, you guys are amazing. I’ll see them in Sedona, you guys should make that contact right now too.” As you can see, this is a major “get” and you should always be on the lookout to develop celebrity friendships at any level so that if they get to know and enjoy your work, you may be fortunate enough to receive a Celebrity endorsement. 4. Editorial 3rd Party Validation testimonials are difficult to receive and are absolute business building gold. This is getting a news publication or broadcast to talk about you in a positive manner. If you can get the Wall Street Journal to talk about you, your methods, how successful you are or share what great work you are doing, this is going to assist your business. That AS SEEN ON or AS SEEN IN section is vital. When we are interviewed on networks or publications, or radio shows, we add those logos and links to our website. 5. A Clinical 3rd Party Validation testimonial is the most difficult to receive. It is when you receive lab results proving your products are better. This is almost entirely for retail products, not services. This is why getting a testimonial from United Labs (UL) is important for all electrical products stating that the product you just bought is electronically certified safe. These testimonials are all good to have, and you must have them, but the further up the ladder you go, the harder they are to get. This brings us back to the story I told at the top of this blog/chapter. If those men who had the chance to post photos or talk about the fact that they had the opportunity to detail Air Force One, they should have been screaming it in any possible way. Make the most of your opportunities. If you need assistance in learning how to get 3rd Party Validation video testimonials, we suggest you grab a seat at one of our Small Business Marketing Plan bootcamps (TheMarketingEvent.com). We show you how to gather them and use them. You can also get us on the phone by signing up for a 30 minute focus call where we can share some Testimonial Secrets with you. That is at www.FreeMarketingConsultation.com. We will talk to you soon.